What if you could pull a giant Pringles can out of your backpack, and turn it into an incredibly safe, easy to fly camera drone in practically no time at all? I just described the Fotokite Phi—one of the coolest quadcopters I’ve ever tried. Where most GoPro-equipped flying machines require you to pull them out of a huge carrying case, attach propellers, and power up a remote control before they ever taste the air, the Phi doesn’t require any of that. The whole ready-to-fly drone—battery, GoPro, and all—pulls right out of the canister. One pull, two twists, and you’re airborne. 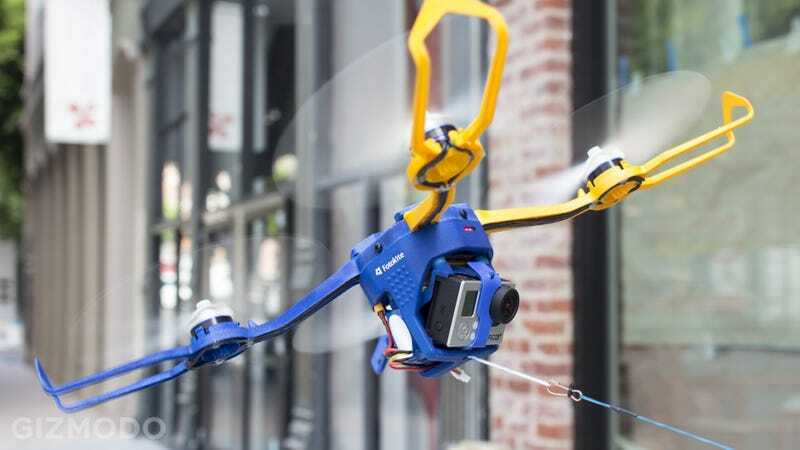 Just point the drone in the direction you’d like it to point, and the built-in inertial sensors (and some clever math that estimates the cable tension) will tell it to fly right out of your hand. No need to turn on the GoPro—the Fotokite does that for you too, and even powers the camera from the drone’s battery to reduce weight and complexity. The best part: you don’t need to know how to pilot a drone! Just let out some line, like you’re flying a kite, and reel it back in when you’re done. It’s nothing like flying a traditional quadcopter, and it doesn’t feel the least bit dangerous. The tether ensures it can’t fly away, the lightweight frame wouldn’t hurt a fly if dropped, and I stuck my finger right into the prototype’s flexible spinning propellers without so much as a scratch. You can do more than aerial selfies with the Phi, since the hockey-puck-sized cable reel also includes a Bluetooth 4.0 remote control. Hold down a button, then twist the reel (which has inertial sensors of its own) in the direction you want the drone to turn. There’s also an Android app for more traditional controls. Hell, there’s even a clever solution for keeping this drone charged: it’ll use the amazing new USB Type-C port, which can (with the right charger) deliver up to 100W of power. Plug the included USB-C cable into even a modest USB quick charger, like the kind that come with the latest high-end smartphones, and you’ll fill the battery in as little as half an hour. A sample shot from the Fotokite Phi prototype, with a GoPro Hero 3 camera. So, what’s the catch? Three things. First and foremost, the Fotokite Phi isn’t a product you can just go buy: it’s a crowdfunded Indiegogo project, with all the risks that entails. Third, the startup’s still figuring out how to get this copter to fight the wind. The early version I saw struggled to stay stable in a light breeze—which the company chalked up to the prototype’s way-too-flexible 3D-printed arms, which can’t hold the propellers stable. The startup says these are the exact reason it’s raising money, though: it needs to buy the equipment to produce stronger, lighter, injection molded parts that’ll improve battery life and stability in one fell stroke. The Fotokite Phi has one heck of a pedigree. It’s the brainchild of Sergei Lupashin, one of the lead drone researchers at ETH Zurich’s famous Flying Machine Arena, and a competitor in the DARPA Grand Challenge (you know, the famous competition that started the race for self-driving cars) before that. His idea of building a drone on a leash was so novel that he was asked to give this popular TED talk, about how his invention could allow citizen journalists to safely and easily film news events from the sky without endangering people below. None of which is to say that I think you should necessarily risk your money on the Phi. Things can always go wrong. But it’s a sweet idea, and I sure would personally love to add one of these to my collection of digital photography tools. The company’s estimating that a complete ready-to-fly drone (minus the GoPro) will cost $500 when it goes on sale sometime next year. If you’re looking to take the plunge, you can reserve one for $300 right now. The startup says it’ll ship to backers as soon as next March.